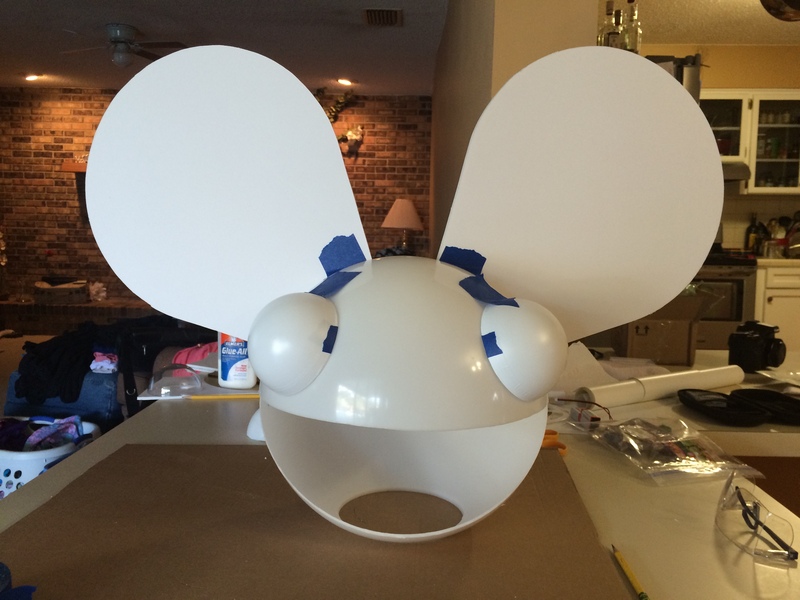 About a month ago one of my coworkers comes to me and asks, “Do you think you could make a Deadmau5 head?” I’m vaguely aware of who Deadmau5 is, enough that I can name at least one song and know what the “Mau5heads” look like, so I consider it for a few seconds and then answer in the affirmative (for anyone who doesn’t know, go here). He goes on to explain that he would like to have one for his son for Halloween this year. It sounds like fun and he gives me an open checkbook, so of course I dive right in. 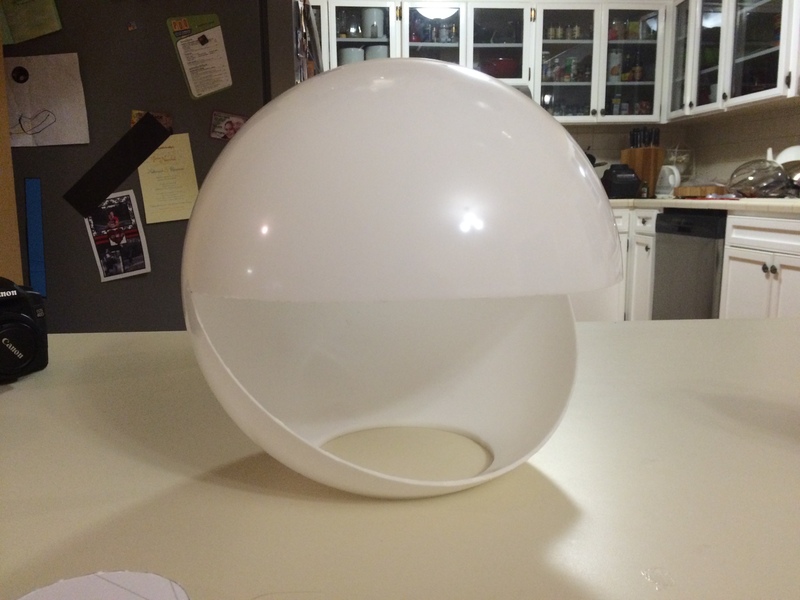 The project started with a 12″ Acrylic Globe meant for lamps and a sheet of foam core board (before you start writing things down, I’ll have a parts list at the bottom of the post). 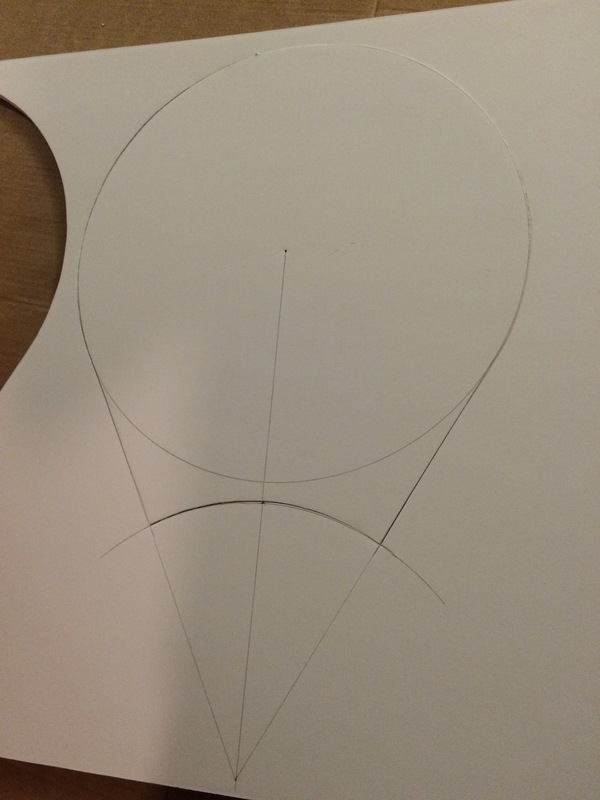 I measured the diameter of the globe (to ensure it was actually close to 12 inches) and used that measurement to draw a large circle on the foamcore, and then performed various complicated maths to decide what shape I was going to make the ears. Truth be told, I guessed a bit… I ended up drawing another circle an inch or so away from the first, and then drew lines that went from the tangent of the first circle to the center of the second. 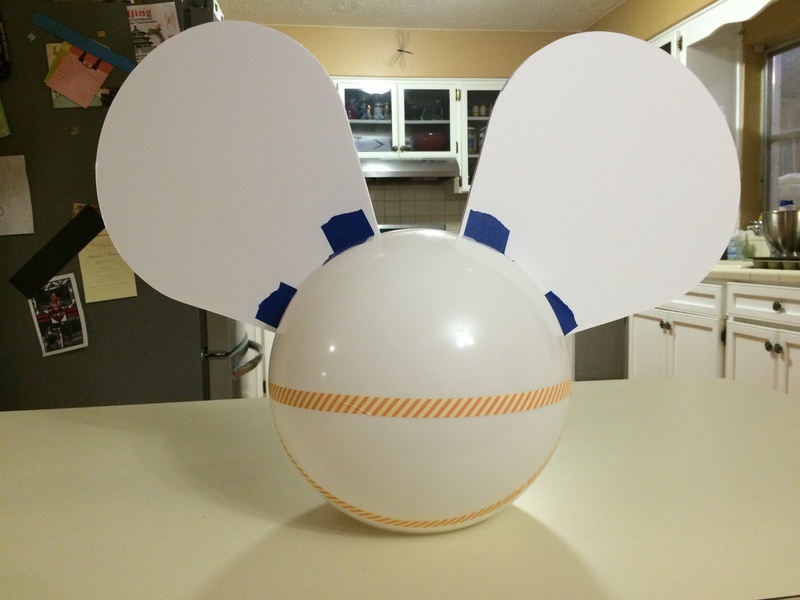 After that was finished, I cut out the ears and did a quick mockup with some painter’s tape to see how it would look. Notice the washi tape in the above photo that outlines the mouth area of the head? 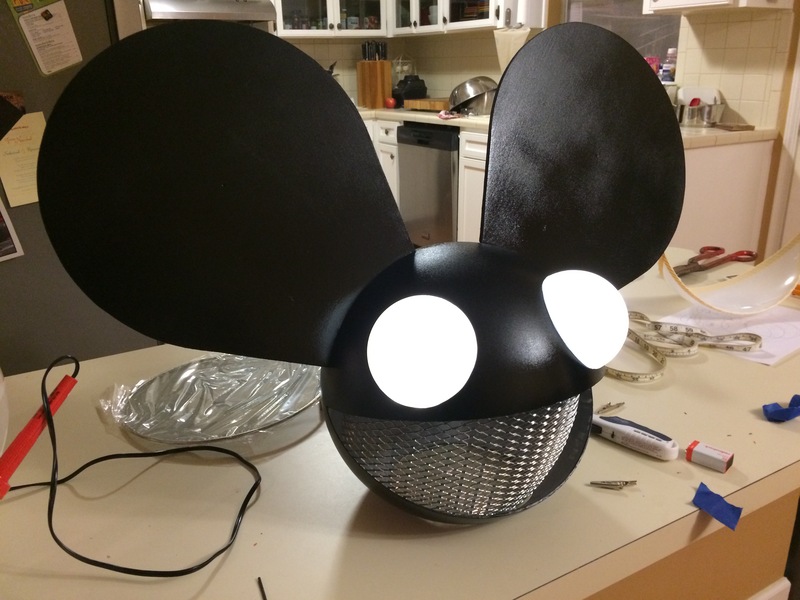 I just sort of eyeballed that, but the idea was to go from one side of the head all the way to the other and make the mouth large enough so that it would not only look similar to an original Mau5head but also provide enough room to see. 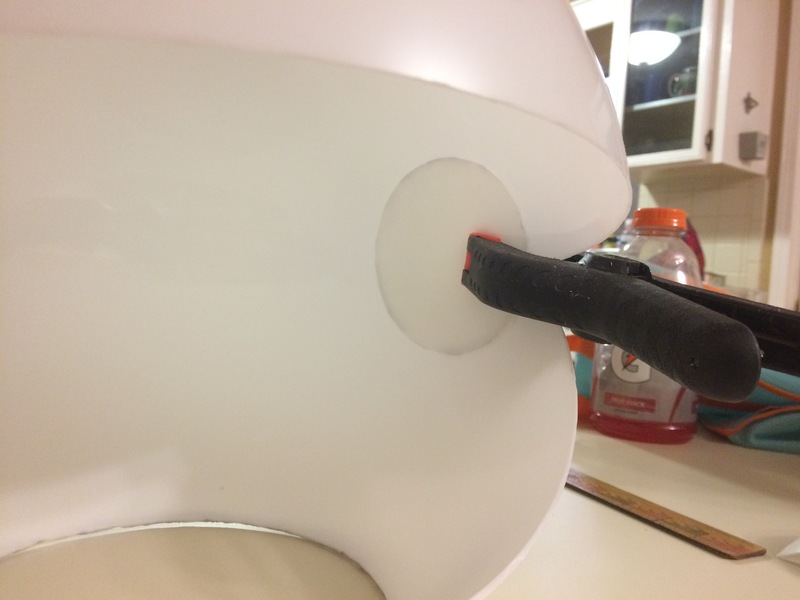 The next step was cutting it out, so I grabbed my trusty Dremel and went at it. It was just after this step that I had my first disaster. 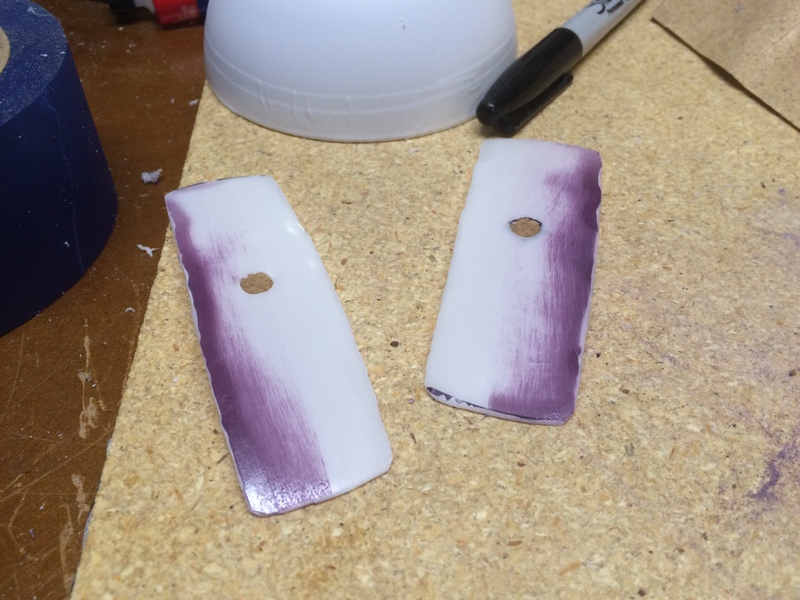 It turns out that this acrylic is pretty brittle, and one of the times I was moving the head around from one place to another I managed to split it almost in half because the corners of the mouth create a really weak spot in the plastic. 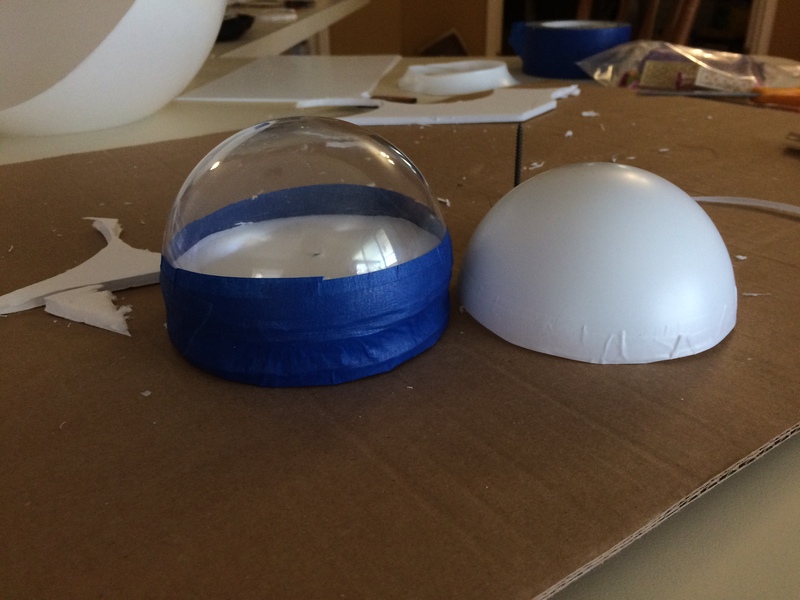 After acquiring another acrylic dome I performed the same cut, but this time I cut some reinforcement circles out of the plastic leftover from the mouth, and then epoxied those into place inside the head near the corners of the mouth. 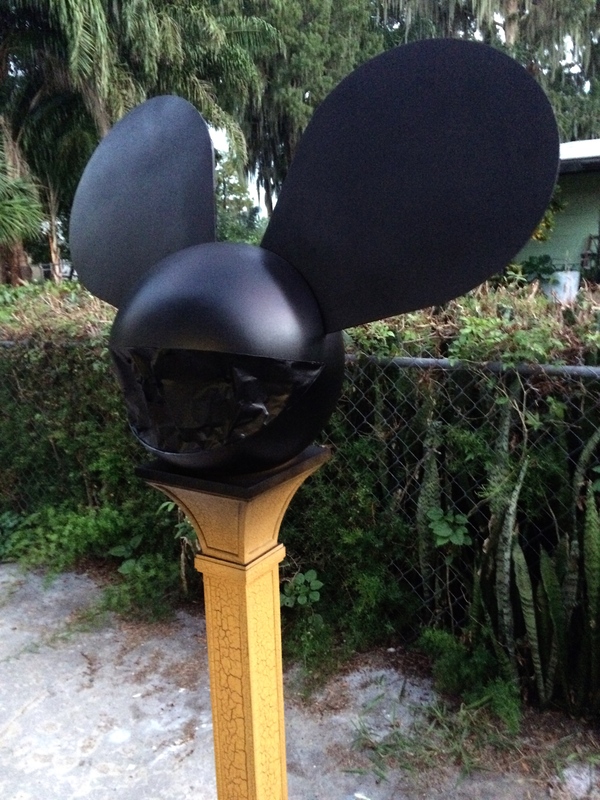 This provided enough reinforcement in that area of the Mau5head to prevent that from happening again. Next were the eyes. 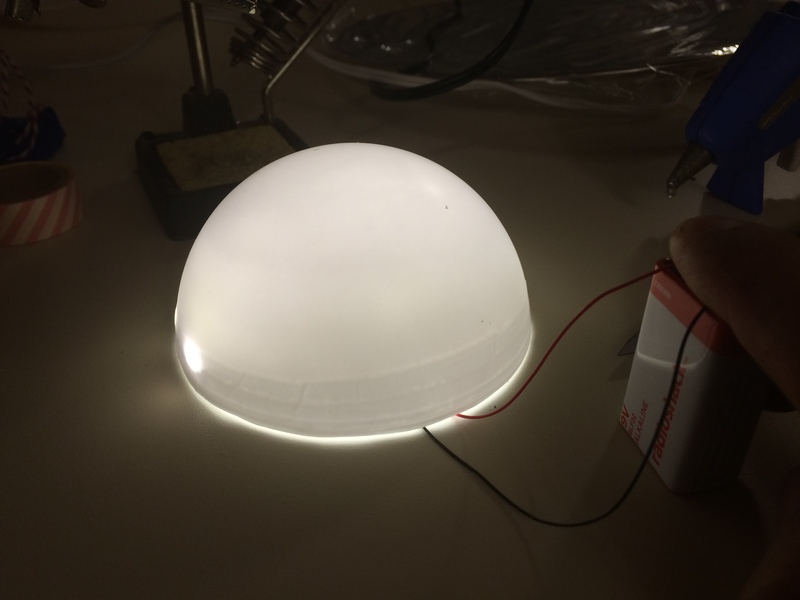 I was originally planning on using some large plastic Christmas ornaments that split in half, but decided I wouldn’t like the look of them once they were painted, and also I wanted to backlight them with LEDs. This, of course, gave me no recourse but to go ahead and build the vacuum form table that I’ve always wanted. 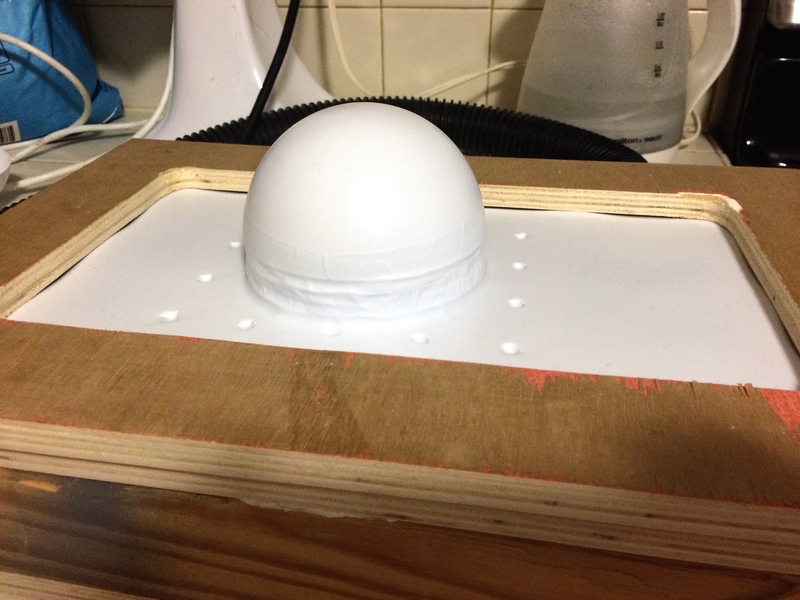 I made a small one, sized for the styrene sheets available at the local hobby shop. I ended up making a buck out of half of one of the ornaments and vacuum formed the eyes over the buck. The second mockup looked even better. I painted the ears with white glue to provide a little extra stiffness and to seal the paper so that it would accept paint without soaking it all up. I then added mounts for the ears using foot long lengths of threaded rod that were hot glued into channels that were cut into the back of the ears. 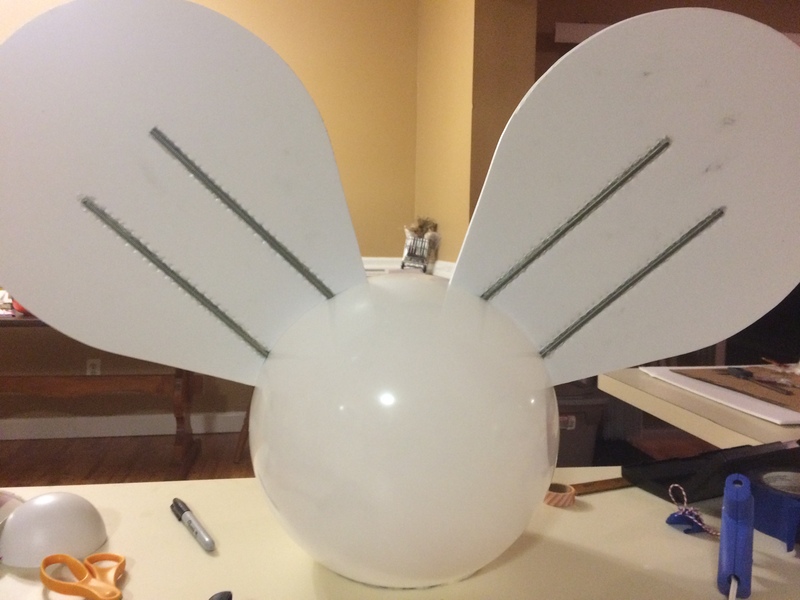 One thing to note… while the hot glue worked pretty well, I ended up redoing one of the ears using E6000 after someone accidentally headbutted a street sign while wearing the Mau5head. If I ever have to build one again I’ll likely do the ears in two layers that sandwich the threaded rod. Lesson learned. 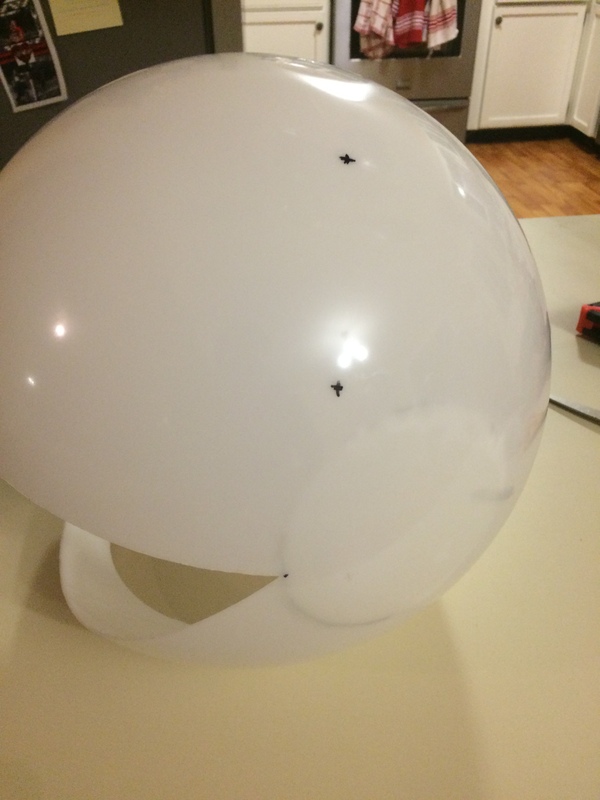 The next step was marking holes on the head for mounting, drilling them out, and then everything was given another test fit. I then prepped and painted the head with rattle cans. Eventually this ended up being four coats of gloss black and two coats of clear. 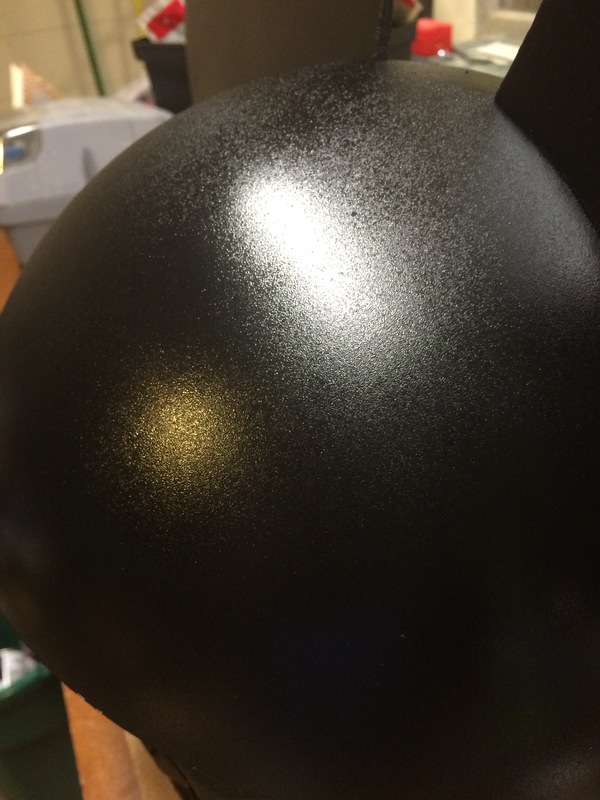 I rushed the paint a bit and didn’t have time to do wet sanding between each coat, so the paint has quite a bit of texture, but honestly this ended up looking great. It catches the light well and looks, well, not too bad. 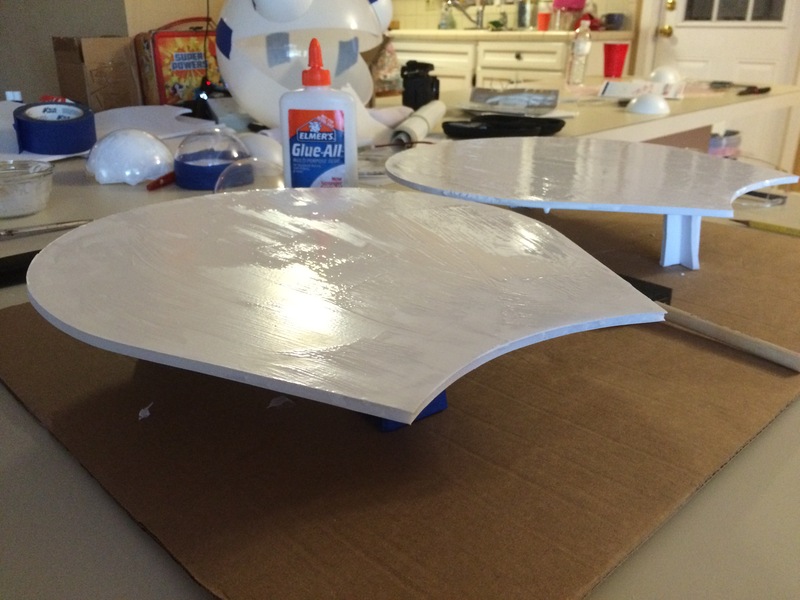 While the first coat was drying, I started working on the eyes. 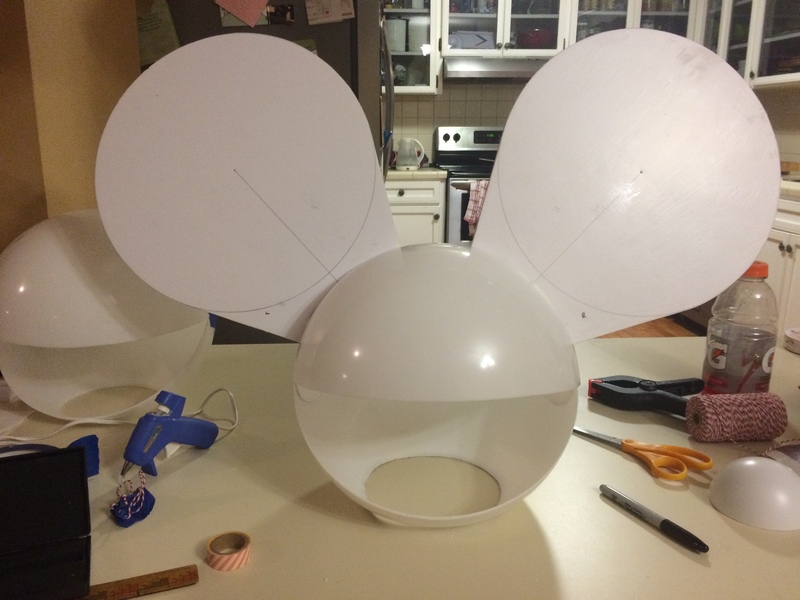 The mounts were made of a couple of strips of plastic that were cut from the remainder of the mouth material that I had used to reinforce the sides of the Mau5head. 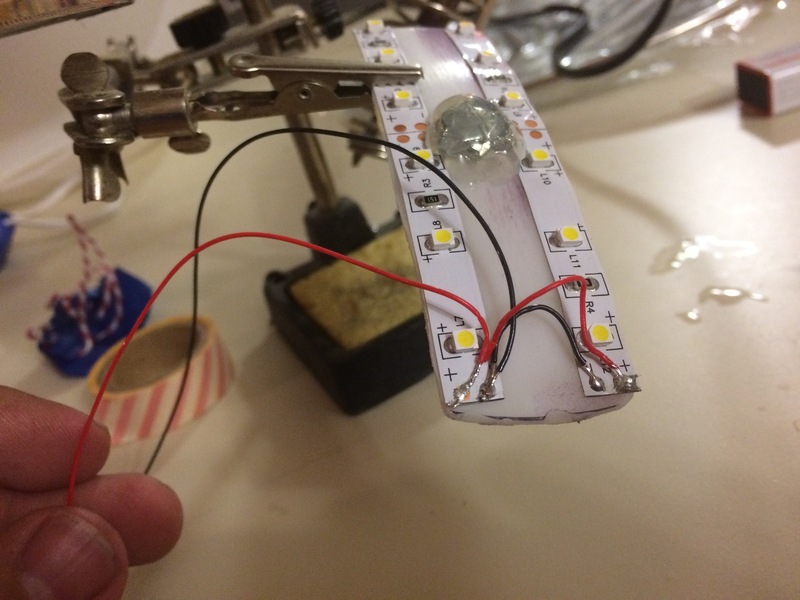 I mounted each of them on my soldering station and got to work on the first of the lights, a strip of LEDs mounted on either side of a short bolt that was hot glued into the hole in the center of the strip. 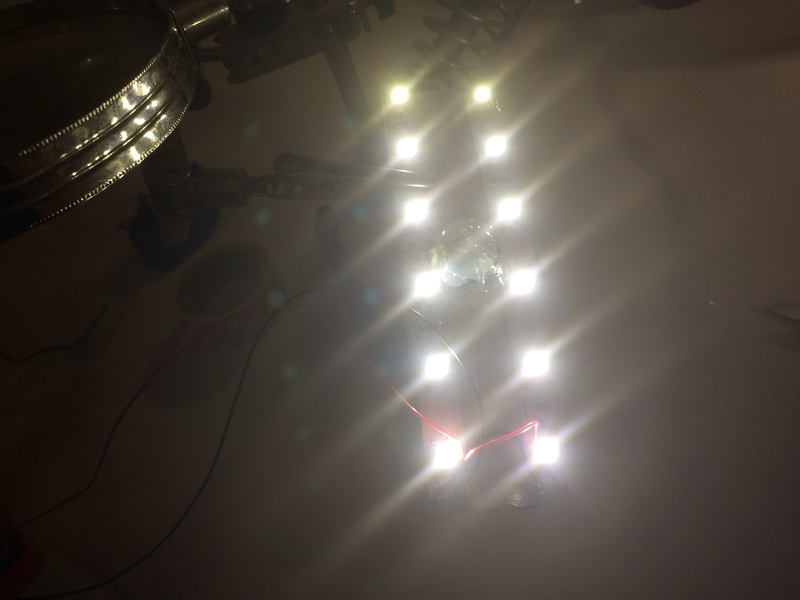 My soldering skills aren’t the best, but the lights worked afterward! 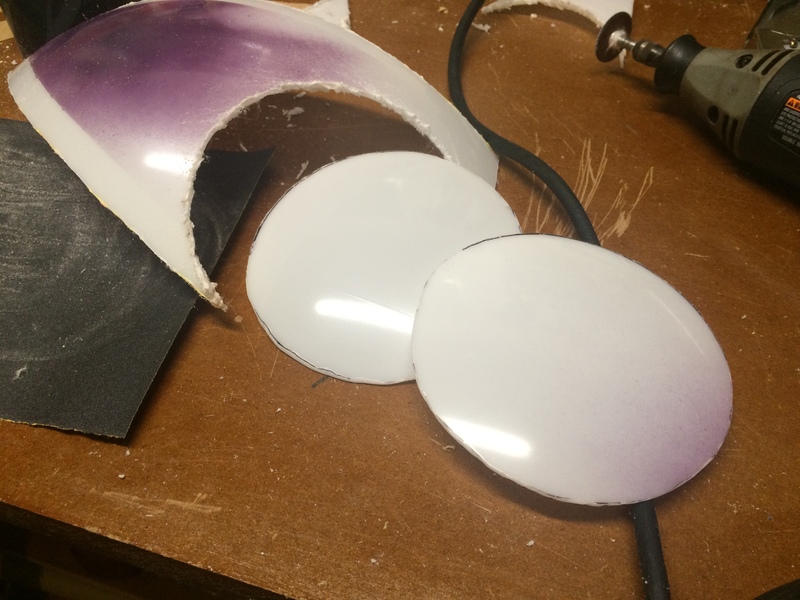 I then mounted the strips on the inside of each of the eyes using a small amount of hot glue. To mount the eyes on the head, I marked where the center of each eye would be and drilled two holes, one for the bolt and the other for the wiring. The mouth grid went in next, made from the lath that is used for putting stucco on a house. It is held in place with epoxy on both ends of the mouth. 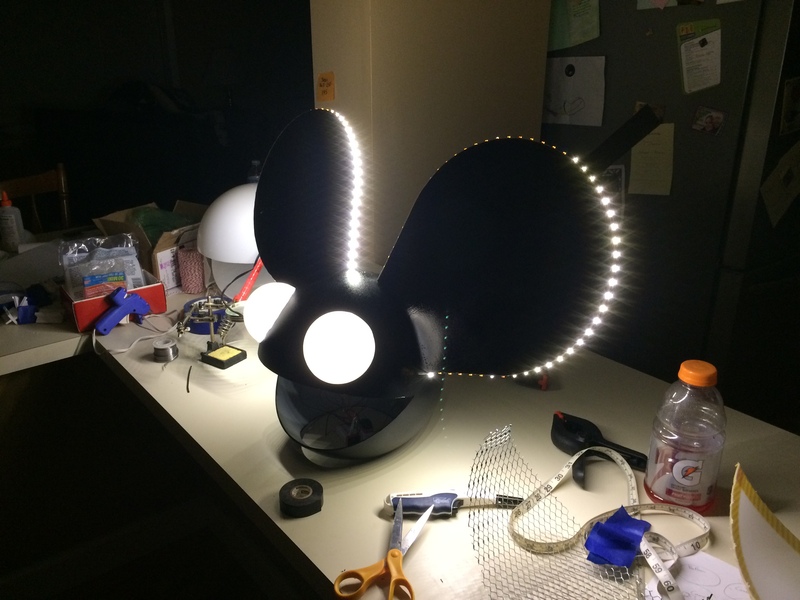 I then mounted the LED strips around the outside edges of the ears, and finished up the wiring inside. 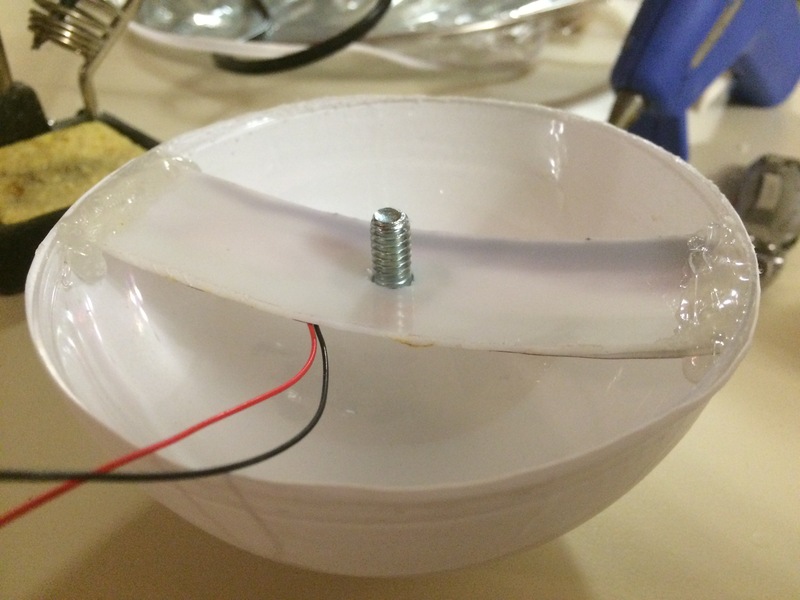 It’s intended to be run at 18v from two 9v batteries that are held in place inside the helmet. Anna ended up making a small mounting bag for them that is held in place using sticky velcro, but I neglected to get a photo of that. Anyway, I turned the lights off and lit it up.. and the results were astounding. 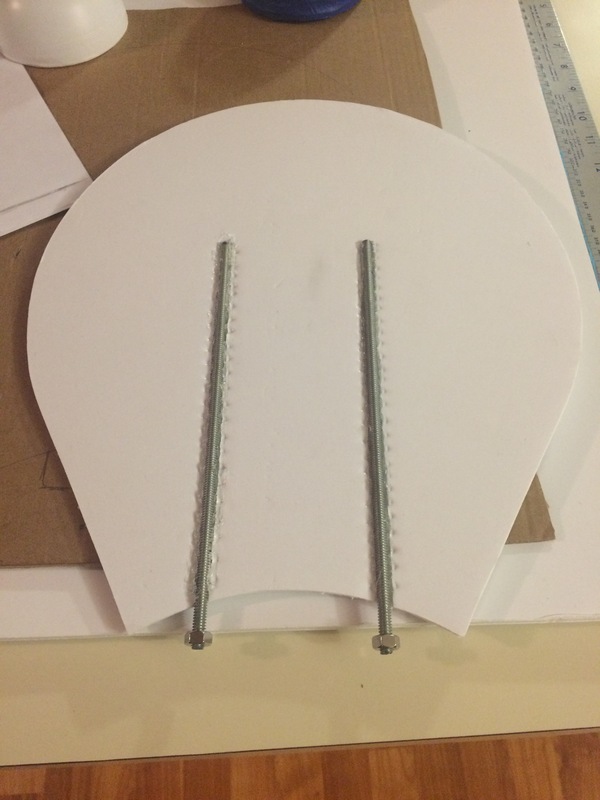 The last thing to go in was a child’s bicycle helmet, I pulled the styrofoam shell out of the helmet and mounted it directly to two of the bolts that are holding the ears in place on the head. 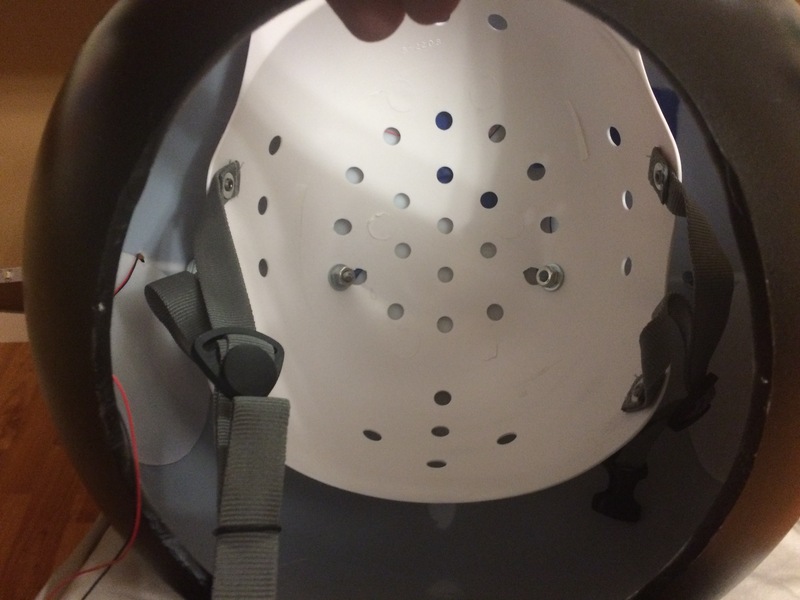 The styrofoam shell can be left out and a small piece of foam placed into the top of the helmet so adults can wear it. I mean, if anyone were inclined to do so. It’s smaller than the real deal, since it was intended to be kid-sized, but still looks pretty good. Overall, I had a really good time making this. After I was finished I was a little sad, because I wanted one for myself. Maybe I’ll get around to that sometime before next Halloween. Assorted wire (I gutted an old mouse) – Free! Hope you enjoyed it! I’ll hand the keys to the blog back to Anna now.